Our group will tour the three core collections, a highlight of the 1.9 million objects that make up the OMCA, to learn about the collection's history and organization. You may learn more about the museum here. 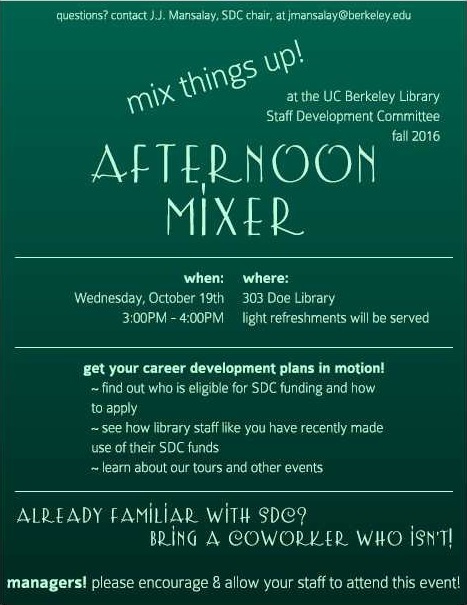 The Library Staff Development Committee (SDC) invites all library staff to our spring mixer, Thursday, May 4th, from 9-11am, in 180 Doe. There will be coffee, tea, and breakfast pastries to help you start your morning. We're excited to share with everyone the new resources that have been added to the SDC website, highlight the great ways staff members have been using their SDC funding, and preview our next staff field trip! In this time of change in American society, understanding diversity and inclusion is more important than ever! This workshop will cover foundational concepts and critical information about gender identity and trans-related issues, which will allow you to better integrate trans-inclusive practices into the library. The Staff Development Committee is pleased to announce that it is sponsoring a field trip to the Asian Art Museum. The Asian Art Museum is "one of the most comprehensive collections of Asian art in the world" and also houses "one of the more comprehensive research libraries on Asian art and culture in the country". The Asian Art Museum is graciously allowing us to tour the museum and its library. Light refreshments will be served. Get to know the SDC committee and learn how SDC can help get your career development plans in motion.